Apple announced some new gear today: new iMac models, new Mac Pro’s, and something really different, the Magic Trackpad. What do you think? Anything you want? Anything you don’t like? Does the Magic Trackpad interest you? Share your thoughts! I think all the items introduced look great. The 27″ quad core i7 iMac looks awesome. I’d buy one in a heartbeat if I had the money. 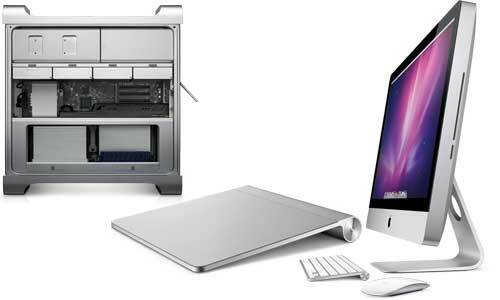 I also do like the idea of the Magic Trackpad, but I’m not sure if it would be in the way on a desk or not. I think it’s worth trying before buying, but I do know that I love the gestures on the Macbook Pro trackpad, and sometimes miss them when I’m using the keyboard, mouse, and external monitor setup instead. As for the Mac Pro, yes, if I won the lottery and money were no object, I’d certainly get a 12 core machine or two just so I could watch it finish encoding videos before it even started. That would be a really nice photo editing workstation as well. But that’s not a machine I ever see myself owning given real budgetary constraints. The Trackpad is good is you are used to working on a laptop and prefer that over a mouse. Personally, I like a mouse better- especially for drawing (of course a tablet is better, but a mouse is better than a trackpad). The computers were due for the update. What I found interesting was the battery charger??? Odd, but makes sense. Why not get everything at Apple instead of running out and buying batteries someplace else. It will be interested to see it the batteries sell and stay or fade away. Oh and one more thing…I was hoping and still hoping for a new iLife announcement. Maybe by the end of the summer? Didn’t iLife 08 come out in August? I ordered the Magic Trackpad. Looks interesting. I am just as fluent on a trackpad as I am on a mouse. In fact, I think that for everyday use, a trackpad is better, but for video and graphic work, I need a mouse. It should be here by the weekend, so it won’t be on this weeks OWC Radio, but the next, that I will give my report. The new iMacs look nice, but the MacPro’s as still just too expensive.